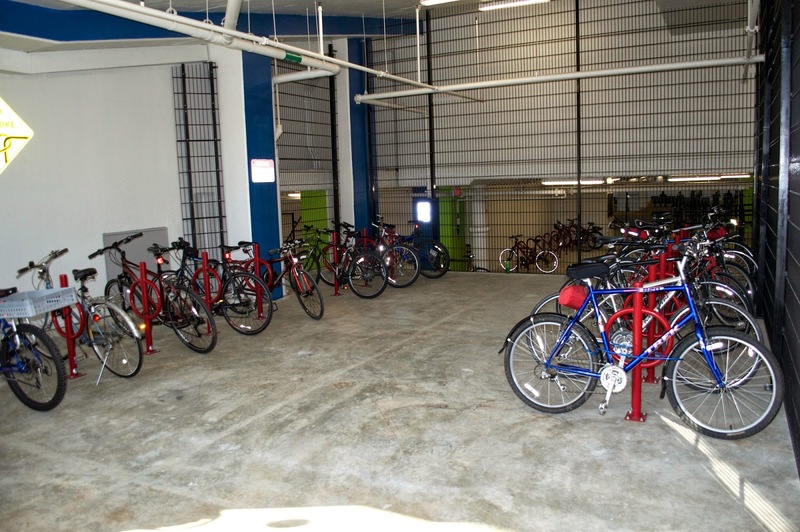 Bike parking at the Wiehle-Reston East Metro station includes a secure bike room available to subscribers for $75 a year and a room available to the public for free. While the secure room is underutilized, with the available rack space about half empty, the public room is too small to meet a growing demand. Often, all the racks are full and riders are forced to lock their bikes to the steal mesh walls. On at least one day in 2016 the public bike room was full to capacity and it was impossible to find space for any additional bikes. Security guards employed by Comstock Partners, the owner of the property, will clip locks and confiscate bikes locked to any objects outside of the bike rooms. More and more people are biking to the Wiehle-Reston Metro and days when the public bike room is full are bound to become more frequent. Not everybody is able or willing to pay for access to the secure bike room. Possible solutions include remodeling the bike rooms or adding outdoor bike racks. Perhaps the best solution would be to eliminate the $75 fee to use the secure room – no one should have to pay to park their bike at a Metro station. We agree with Richard that the unsecured bike room, located near the secure bike room, is frequently overflowing with bikes. As we reported back in August 2014, the free room has a capacity of 36 bikes but usually contains several more than that. On Thursday of last week there were 39 bikes there. Many of them, we estimated 15 or so, have been parked there long enough for their tires to be flat or grossly under inflated. The bike room was not intended to be a long term storage area. The county needs to address the problem. Another way to address the problem is to allow short term use of the secure bike room. Currently only those who pay the annual fee of $75 ($15 of which is refundable) can use the room. There is no daily use. Motorists can pay a daily fee to park cars using their SmartTrip cards and bicyclists should be able to do the same. Yet another solution is to add bike racks on the plaza outside the station entrance. According to the approved development plans for the property, 29 hoop racks will be installed around the plaza. The only racks there now are outside the Blvd apartments, filled with bikes belonging to the Blvd. We're working with the county and the developer to have the required 29 racks installed. We've been told that temporary racks will soon be installed until the new permanent racks appear, and that the developer seeks to modify the locations of the racks and add 11 more racks on the plaza for a total of 40 racks with a capacity for 80 bikes. That will help.